What meals do you prepare to get a fast and delicious meal on the table? For me, one of my favorite things to do is pick up a store bought rotisserie chicken on the way home from work. I love to use rotisserie chicken as a little shortcut in many of my recipes including some soups, pastas, and enchiladas. This recipe that I'm sharing with you today is another quick and easy meal to get onto the table for your family on one of those busy days or on a day that you don't feel like spending much time in the kitchen. For this recipe, I picked up a rotisserie chicken at Walmart where they have Effortless Meals available where you can purchase a rotisserie chicken, a side dish, and a liter of Coca-Cola. When I get home, I preheat the oven, take out the chicken, and make the chimichurri sauce while the chicken cools (because sometimes it's a little too hot to handle!). Then I shred the chicken, and prepare the tacos. The whole process takes less than half an hour! For an even faster meal, you can skip baking the taco shells and use crispy ones from the store. Or you can make soft tacos and use store-bought mini flour tortillas. And you can use any toppings that you want, this recipe is so flexible! These Effortless Meals can be found by the check-out aisles as well as in the deli section of Walmart! They also have their Marketside Pizzas available in several varieties that you can take home and bake. For more quick meal ideas, please visit Effortless Meals. Place the parsley in a food processor and pulse until the leaves are chopped. Add the remaining ingredients and pulse until smooth and creamy. Makes about 1 1/2 cups. You will have leftovers. This sauce freezes well or you can store in the fridge for about 3 days. Preheat oven to 350. Place wire rack on a rimmed cookie sheet. Take four corn tortillas at a time, wrap in damp paper towels and microwave until the tortillas are soft and pliable. Fill each tortilla with chicken mixture and a drizzle of chimichurri sauce, then stitch shut with a toothpick, then place on the wire rack. Repeat this process to make the rest of the tacos. Place the wire rack/cookie sheet in the oven and bake for about 10 minutes or until the tortillas are dry and crisp. Place the tacos on a plate, remove the toothpicks, and garnish with avocados and more chimichurri sauce. 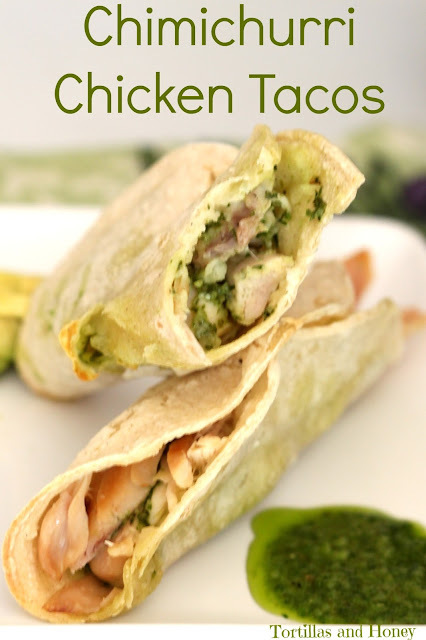 Chicken tacos are always quick and make for an easy dinner. I love the chimichurri sauce you have on these!! Yum! I looooove chimichurri sauce, so this is definitely going on my to-make list! What a great chicken taco! Your chimichurri sauce is awesome and love it paired with the chicken!